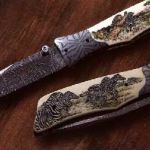 Cactus Custom Knives: From the avid collector to the aspiring knife enthusiast, Cactus Custom Knives can provide you with the finest, custom designed knife or other cutlery. 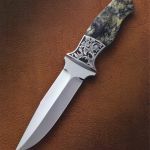 Shown with "Paisley" pattern, mosaic blade and a "Spider Web" bolster and carved ivory handle. Price as shown is $1,295.00. 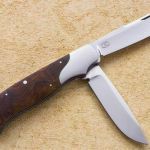 All dressed up, this modified Semi-Skinner blade is 3-1/4" with a handle length of 4-3/4". Can be packaged with the Caper for the Texas Trophy Set. 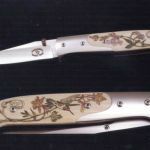 Price: $1700.00 as shown with Scrimshaw by Linda Karst-Stone. 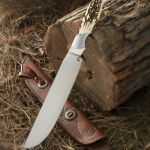 With a 3-3/4" blade and 8-3/4" overall, this drop-point knife is the perfect size for large or medium size game. 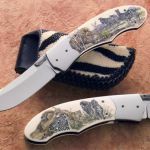 Shown with Bighorn Sheep handle and engraving by Gil Rudolph. Price: $2,700.00 as shown. 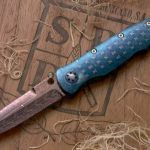 If purchased with stabilized wood handle and no engraving: $600.00. 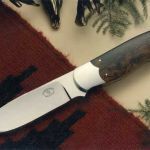 Shown with Sambar Stag, 154 cm Stainless Blade, 10" blade, 16 3/4" overall, $2,200.00 with sheath. 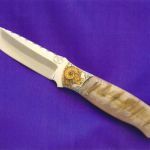 Made with a one-of-a-kind fossil walrus tusk handle and with presentation grade Mother of Pearl. 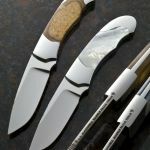 Both knives have double bolsters and CPM-S30v stainless steel. Price for each as shown $1,200.00. Note: The fossil walrus handle in all likelihood cannot be duplicated. 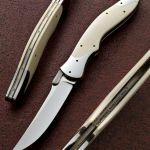 Upscale folding filet knife with ivory handle. 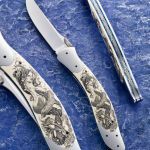 The Mermaid scrimshaw is by Linda Stone. 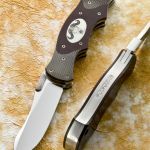 This folding knife sports a 2-1/4" blade and is 5-1/2" when open. Shown with Gold Lip Pearl and 18k Rose Gold-plated, Stainless Damascus and Gold screws. I make this model with a Clip-Point blade and a Wharncliff blade. Price: $995.00 as shown. 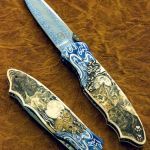 Nouveau - "Creatures of the Night"
Shown with Nitre Blued Mosaic Damascus and Mammoth Ivory with Scrimshaw by Linda Karst-Stone. With a 3" blade and a 4" handle, this is a classy slim knife. Price: $1,300.00 as shown. The blade here is 3" and a 4-1/2" handle. 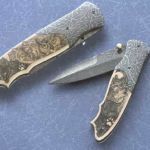 This knife features double file-worked liners and Stainless Damascus. Price: $1,300.00 as shown. 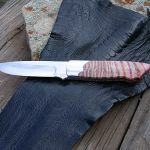 Shown with Damascus blade and bolster with Meteorite handle. A large folder with a 4" blade and 5" handle. Hence the name of the folder Cinco Grande. 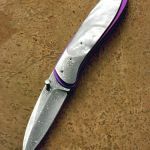 The blade is CPM 5-30V with 3/32" thick Titanium liners. 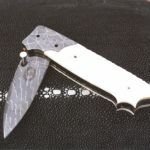 The bolster is 416 Stainless and the handle material is black and green G-10. 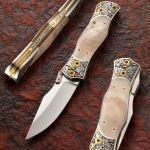 This upscale version has its ivory handle carved by Dennis Holland with engraving by Chris Meyer. Damascus inlay and bolster. It has a CPM 154 stainless steel blade. Engraved by Loyd McConnell and shown with Mammoth Ivory handle. Set of eight dinner knives with pearl handles and a custom carved display box. $10,000 for a similar set. 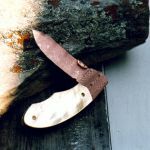 Ivory handles. The top knife has a 3" blade and the bottom knife has a 4" blade. Engraving by Loyd McConnell. Price as shown $1,600.00 and $1,400.00 respectively.